Landowners apply at their local property assessor for agricultural tax reductions. 2. How Do Property Taxes Apply to Vacant Land Investments? Tillers of the soil have a reason to breathe easier, as local and federal governments offer numerous tax abatement programs for land parceled out for agriculture. In New York state, to qualify for an agricultural assessment, the land in question must be at least 7 acres and produce at least $10,000 annually. States also offer reduced assessments for owners to develop specific types of land, such as forests and replanted orchards and vineyards. In New York, for example, landowners devoted primarily to reviving orchards and vineyards are exempt from property tax assessments for up to four years. When a local assessor deems an area of land to be agricultural in nature, it may be eligible for a land assessment that is less than market value, resulting in a lower tax bill. What qualifies as land used for agricultural purposes varies from state to state. In Brevard County, Florida, simply being in an agricultural zone does not automatically qualify a landowner for this classification. She will have to apply with the property appraiser's office within a specified period, and she may not transfer the classification if the land is subsequently sold. A variety of land types for different agricultural purposes may be subject to tax breaks. In Grayson County, Texas, livestock operations that meet the county appraiser's guidelines may qualify as agricultural. For example, a qualified horse operation with at least one animal per productive 4 to 5 acres qualifies, as long as the animal is not stabled or a pet. 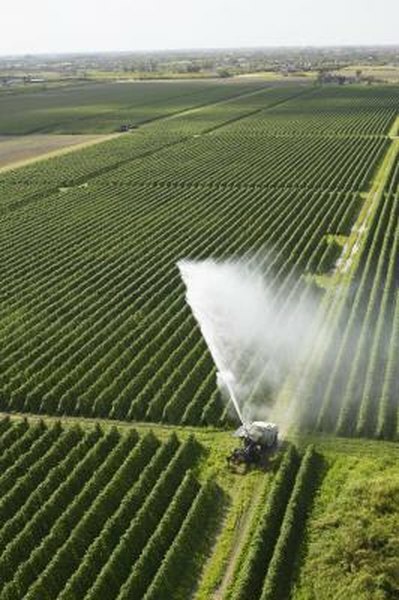 Different land uses qualify for the agricultural distinction; in Grayson, these include irrigated and dry land crops; orchards with a cultivation intensity of 14 trees per acre; and timberland, wasteland and wildlife management areas. All states give preferential property tax treatment to agricultural land, according to "Forbes," but the nature of the tax breaks themselves vary according to state. "Forbes" cites that agricultural use of land on a 30-acre farm in Pennsylvania trimmed what would have been an annual property tax bill of $27,000 by $9,000. In Bedminster, New Jersey, in 2012, a 4 acre estate was assessed at more than $3 million, whereas the 92-acre farm-qualified land surrounding it was assessed at a little more than $30,000. Going agricultural can also be beneficial from the standpoint of income tax, provided that the land constitutes a farm by Internal Revenue Service standards. To be considered a farm, the landholder will have to show that he was profitable three out of five years of operation, otherwise he will be considered a hobby farmer and not enjoy the same tax benefits. As a farm, he can claim farming losses on taxes. Even if the land is not specifically a farm, a landowner might still be able to wrangle tax deductions if she donates land for conservation purposes to a charitable land trust.